The summary provides a quick overview of results, with details in related publications; click on Publications tab to access cited publications. More interference: A huge challenge in full-duplex network design relates to reducing or managing some form of interference caused by a transmitter to a receiver. When it is interference caused by the node’s own transmissions, then the interference is labeled self-interference. When the interference to reception is caused by a different node, it is often labeled as inter-node interference. Inter-node interference can be within a cell (intra-cell) or across cells (inter-cell). In traditional half-duplex networks, intra-cell interference is either not an issue (e.g. in FDD networks) or a small part of an overall design challenge (e.g. in TDD networks like WiFi). With full-duplex transmissions, intra-cell interference can be the dominant part of the problem, simply because uplink and downlink are simultaneously active. Beyond data: A big question behind many of our research results is how we can use full-duplex to improve the spectral efficiency of the network by reducing the overhead of the control channel. As PHY data rates have increased in each generation of the wireless networks, the control overhead has also increased. For example, control channels in LTE consume nearly 26% of resources and MAC overhead in WiFi is close to 50%. Trends in next-generation networks: All next-generation networks are adding more spectrum and antennas, and reducing cell sizes. Also, mobile devices are already more “powerful” than infrastructure nodes, in that in many cases they access more spectrum; e.g. smartphones can access both licensed and unlicensed bands while infrastructure nodes for cellular and WiFi can often only access their respective bands. Each of the trends provides an avenue to develop new ideas and new design challenges. Overview: We highlight our contributions in three directions. First, leveraging the fact that mobile devices are more powerful than infrastructure in their ability to access spectrum, we proposed distributed full-duplex, to reduce intra-cell inter-node interference. Essentially, smartphones talk to each other over unlicensed bands to cancel out intra-node interference in cellular bands. Second, we continue to address self-interference challenge. We not only developed new methods to reduce the impact non-linearity in self-interference cancellation but also started to address the bigger challenge of scaling full-duplex to a large number of antennas. Towards that end, we proposed SoftNull, a new method to eliminate the need of analog cancellers. Instead, we utilized a large number of antennas in massive MIMO to reduce self-interference by relying only on digital processing. Third, we have developed the concept of continuous feedback channel to reduce the overhead of control overhead. Our first set of results reduced the overhead of channel state feedback, which is essential for multi-user beamforming in multi-antenna systems. This is the first use of full-duplex to achieve improved spectral efficiency for uni-directional traffic. studied the feasibility of such a scheme and showed that in many scenarios of interest, there is a high probability of finding open ISM band [C20]. Nonlinear Distortion in Full-duplex: In full-duplex systems, due to the strong self-interference signal, system nonlinearities become a significant limiting factor that bounds the possible cancellable self-interference power. In [C10], a self-interference cancellation scheme for full-duplex orthogonal frequency division multiplexing systems is proposed. The proposed scheme increases the amount of cancellable self-interference power by suppressing the distortion caused by the transmitter and receiver nonlinearities. An iterative technique is used to jointly estimate the self-interference channel and the nonlinearity coefficients required to suppress the distortion signal. The performance is numerically investigated showing that the proposed scheme achieves a performance that is less than 0.5dB off the performance of a linear full-duplex system. SoftNull – Massive MIMO Full-duplex: (Collaboration between PIs Sabharwal and Zhong) A key challenge in full-duplex is the need for new analog components, namely for analog cancellation. The analog complexity increases as the number of antennas increase, e.g. in Massive MIMO systems. 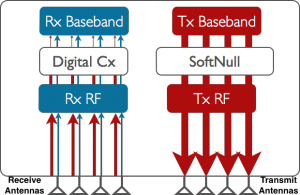 We proposed transmit side beamforming to enable full-duplex capabilities in Massive MIMO. We first developed theoretical foundations that showed the degrees of freedom benefits in idealized systems [C14, J20]. Then we developed SoftNull to enable full- duplex in many-antenna systems. Unlike most designs that rely on analog cancelers to suppress self- interference, SoftNull relies on digital transmit beamforming to reduce self-interference. SoftNull does not attempt to perfectly null self-interference but instead seeks to reduce self-interference sufficiently to prevent swamping the receiver’s dynamic range. Residual self-interference is then canceled digitally by the receiver. We evaluate the performance of SoftNull using measurements from a 72-element antenna array in both indoor and outdoor environments. We find that SoftNull can significantly outperform half- duplex for small cells operating in the many-antenna regime, where the number of antennas is much more than the number of users served simultaneously. See [J15] for more details. Continuous Feedback Channels using Full-duplex to Reduce Control Overhead: Till date, most studies have focused on spectral efficiency increase in full-duplex systems by bi-directional data communications. However, control channels consume a fair bit of resources in actual systems and hence reduction in control overhead is a high research priority. In our ongoing work, we are leveraging full-duplex to reduce control channel overhead. Our first line of contributions is reducing the overhead of channel state feedback for downlink multi-user beamforming. In [C18, C27], we developed the idea of continuous feedback for sequential beamforming that update beamforming weights while also performing downlink transmission. The resulting system has complex interference patterns. We show that despite the increased interference, the resulting system can outperform feedback systems that rely on half-duplex. Overview: As noted above, full-duplex operation allows activation of more links simultaneously. This may appear to increase throughput via high spatial reuse but the benefit is not immediately obvious since more simultaneous links also mean more interference. Two major ongoing collaborations, between PIs Sabharwal and Diggavi, and PIs Shroff and Sabharwal are theoretically characterizing the network level performance due to full-duplex operation. Our information-theoretic analyses show clear benefits of full-duplex in many practical regimes of operation. A highly relevant regime for next-generation networks include regimes where base-stations with a large number of antennas serve a small number of single-antenna mobile users in each service slot, i.e. the massive MIMO regime. Our work has also characterized the regimes in which traditional use of multiple antennas is better or worse than full-duplex use of those antennas. That is, no single technology wins everywhere since they generate different interference patterns and hence have difference signal/interference power terms. Multi-cell network capacity analysis (Collaboration between PIs Sabharwal and Diggavi): While it is easy to show that full-duplex will increase spectral efficiency in small 2 or 3 node networks, it is unclear if the benefits translate to network-scale operations. In our ongoing work [C7, C9, C21], we have started to lay the foundations for multi-cell analysis of full-duplex operation. To summarize our work in [C21], we first characterize the degrees-of-freedom of a multiuser MIMO (MU-MIMO) full-duplex network with half-duplex mobile clients, and derive the regimes where the inter-mobile interference can be mitigated to yield significant gains over the half-duplex counterpart. The achievability is based on interference alignment and requires full channel-state information at the transmitter (CSIT). Next, we study the case with partial CSIT where only the base station acquires downlink channel values to avoid collecting network-wide CSIT at all transmitters in the system. We show that the key to achieving the sum degrees-of-freedom upper bound with only partial CSIT is the ability of the base station to switch antenna modes that can be realized via reconfigurable antennas. Fundamental capacity gains with full-duplex (Collaboration between PIs Shroff and Sabharwal): In this work, we answered a fundamental question about the capabilities of full duplex versus other multi-antenna technologies. To ensure a fair comparison, we characterized the achievable throughput in wireless networks with a fixed number of RF chains. For example, with two sets of RF chains, we can build a half duplex MIMO system that achieves the same gain as full-duplex for a pair of nodes. However, while this gain is the same between a pair of nodes, the gains are unclear when multiple nodes are involved, as in a general multi-cellular or multi-hop network. The key reason is that MIMO and full-duplex have different interference patterns. A MIMO transmission blocks transmissions around its receiver and receptions around its transmitter. A full-duplex bidirectional transmission blocks any transmission around the two communicating nodes but allows a reception on one RF chain. Thus, in a general network, the requirements for the two technologies could result in potentially different achievable throughput regions. Beginning with our work in [C19], we have precisely characterized the conditions under which these technologies outperform each other for a general network topology under a binary interference model. This is the first work of its kind to precisely characterize the conditions under which these technologies outperform each other for a general network topology under a binary interference model. The analytical results were also are validated using a testbed with software-defined radios. This work goes towards answering one of our major research challenges of how to best handle interference when you have multiple nodes. Overview: We have developing protocols that can achieve close to theoretically predicted gains. A common theme in our major results is the innovative development of control channels and in some cases, control-channel-less operation. We have developed two protocols for distributed access systems, specifically WiFi, called PoCMAC and MUSE. Beyond traditional network design, we have also developed protocols for cut-through routing for multi-hop or hierarchical networks. The key innovation is to enable a wire-like behavior in multi-hop wireless network. Finally, we have developed first scalable multi-cast protocol, where the feedback scaling is much better than all prior work. Distributed protocols for managing full-duplex interference (Collaboration between PI Sabharwal and Prof. Lim of GIST, Korea): In distributed access systems like WiFi, it is not obvious how the information theoretic gains can be translated into practical gains since there is no central entity which has full network level knowledge. In [J17], we designed a random-access medium access control protocol using distributed power control to manage inter-client interference in wireless networks with full-duplex capable access points that serve half-duplex clients. Our key contributions are two-fold. First, we identify the regimes in which power control provides sum throughput gains for the three-node atomic topology, with one uplink flow and one downlink flow. Second, we develop and benchmark PoCMAC, a full 802.11-based protocol that allows distributed selection of a three-node topology. The proposed MAC protocol is shown to achieve higher capacity as compared to an equivalent half-duplex counterpart while maintaining similar fairness characteristics in single contention domain networks. We carried out extensive simulations and software-defined radio-based experiments to evaluate the performance of the proposed MAC protocol, which is shown to achieve a significant improvement over its half-duplex counterpart in terms of throughput performance. MUSE: Flores and Knightly introduced MUSE [C17, C31], the first system to achieve full-rank uplink multi- user capacity in a fully distributed and scalable manner without a control channel. MUSE is the first PHY and MAC system that enables scalable full-rank uplink multi-user multiplexing without requiring a control channel. In MUSE, no control messages are used for channel estimation, CSI feedback, and channel-based user selection. The Knightly team designed MUSE-PHY, which decorrelates users’ signals through Arbitrary Cyclic Shift Delays, enables preamble-based clean channel estimation at the receiver with the Dynamic Orthogonal Mapping matrix and adapts to variable traffic demand of distributed transmitters. The team designed a fixed-overhead scalable MUSE-MAC that enables a multi-user multi-stream transmission through a single medium access contention. MUSE-MAC attaches a random set of additional users to the winning-user and assures the rank of the group equals the number of antennas at the AP. The research experiments demonstrated full-rank multiplexing gains in the evaluated scenarios that show linear gains as the number of users increase. Our experimental results show an average PHY capacity utilization of 197%, 290% and 395% for 2 to 4 concurrent users respectively with evaluated rates and maintain constant overhead as the number of users increases. Creating a “wired” network in wireless networks via full-duplex: PI Shroff developed the first fully distributed throughput-optimal scheduling algorithm for “cut-through transmissions” [C23]. The idea is that by exploiting the full duplex communication of radios, one can transmit messages over multiple links as if transmitting over a wired network. The idea is that by exploiting the ability to cancel self-interference, one can create a virtual cut-through transmission, where for a traffic flow that traverses through multiple links, every node along the route can receive a new packet and simultaneously forward the previously received packet. This wireless transmission scheme brings new challenges in the design of MAC layer algorithms that aim to reap its full benefit. First, the MAC layer rate region of the cut-through enabled network is directly a function of the routing decision, leading to a strong coupling between routing and scheduling. Second, it is unclear how to dynamically form/change cut-through routes based on the traffic rates and patterns. In this work, we introduce a novel method to characterize the interference relationship between links in the network with cut-through transmission, which decouples the routing decision with the scheduling decision and enables a seamless adaptation of traditional half-duplex routing/scheduling algorithm into wireless networks with full-duplex cut-through capabilities. Based on this new interference characterization, a queue-length based CSMA-type scheduling algorithm is proposed, which both leverages the flexibility of full-duplex cut-through transmission and lends itself to a fully distributed implementation. This work addresses both the challenges of interference management and having low overhead distributed scheme. Multi-rate multicast with limited feedback: A major hurdle in deploying large-scale multicast has been the large feedback needed to achieve good throughput and delay for multicast transmissions. This is one of the reasons why many current solutions of multicast simply use multiple unicast flows to simulate multicast, a very inefficient way of using the wireless broadcast medium. PI Shroff developed the first known multicast transmission/feedback technique which approaches the optimal throughput with a constant feedback overhead independent of the number of receivers. This is in contrast to traditional approaches that either achieve high throughput at the cost of prohibitively large (e.g., O(n)) feedback overhead or achieve low feedback overhead but without either optimal or near-optimal throughput guarantees.